DLSU, handa na ba kayo? 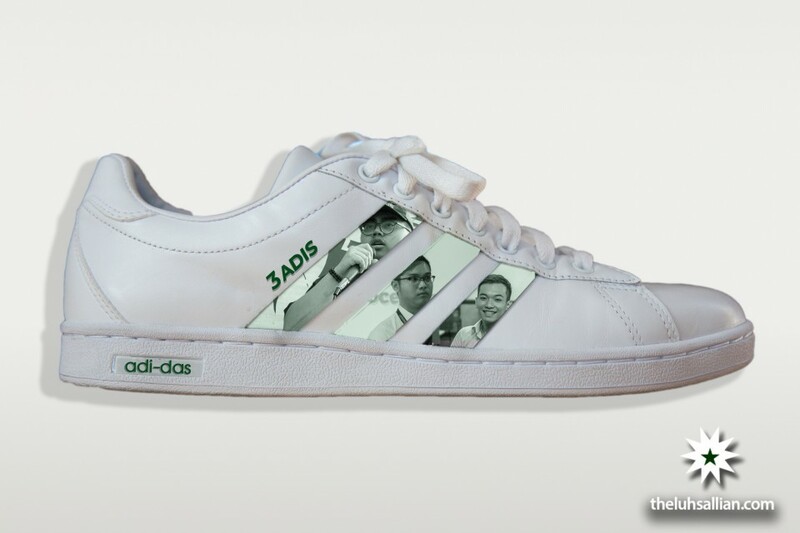 Continuing the trend of Lasallian excellence in putting up shoe businesses out of ingenuity and a desire for an exciting new life, the newest home-grown shoe brand to be launched for the Lasallian community is Adi-das. The brand, owned by no other than the University Student Government’s (USG) big boys, Vice President for Internal Affairs and Adi-das Social Media Executive Adrian Mendoza, Vice President for External Affairs and Adi-das Marketing and Merchandise Manager Adrian Asoy, and Executive Treasurer and Adi-das Accounting Officer Adrian Briones, will be the next big thing, being in partnership with Marquina Shoemaker. Distinct branding, undisputable fashion sense, practicality—these are the three things that were determined important by the newest designer shoe company that will have its company launch on April 23 this year, at The Verdure, Fifth Floor of Henry Sy Sr. Hall. Introducing its first shoe model, the 3ADIS, the event will highlight performances from La Salle Dance Company-Street, University Week 2019 Central Committee, and De La Salle Innersoul, all of which Adi-das will be sponsoring starting the next term. Being a business venture, sponsorships and partnerships will be entertained through email at adi.originals@dlsu.edu.ph. Invitation to the event is RSVP, and deadline of confirming the attendance to the event is April 2, at 4:13 pm. Tickets to the event may be claimed at the USG Conference Room from April 8 to 12.